"Reader level: Beginning to Advanced"--Page 4 of cover. Start reading Excel 2019 Bible on your Kindle in under a minute. Excel® 2019 Bible is the must-have for everyone using Excelfrom beginners and intermediate users to actual power users. Even if you think in spreadsheets, this one-of-a-kind resource offers hundreds of pages of Excel tips, tricks, and techniques you can't find anywhere else. In addition to providing everything you don't know about the new updates and features in the latest release of Excel, it opens levels of higher productivity, faster, with valuable hacks to creating formulas, charts, and other visualizations, as well as managing and analyzing data. 1. I at first could find the worksheet file. Turns out if I use Firefox or Edge there is no problem. With Google Chrome (my usual browser) there is simply no download button! I am therefore updating my review from one star since the original version was based on thinking the worksheet file was simply not available. 2. Not all worksheets have examples. For example one worksheet discussed in chapter four (Figures 4.20 - 4.22) is not available in the download. This review is a bit premature because I am only on chapter 5 but I am leaving it here, edited, to correct my earlier one-star version. This book is nothing but a treasure to be mined. This book is full of probably good information but as an intermediate user of Access I found the book extremely frustrating. I need to be able to use an Index to drill to specific information and this book does not work that work. The key words here are "comprehensive tutorial" - it builds knowledge from "beginner" to "advanced" by using examples and expanding them through tutorial type scenarios. I need more of an reference with exact syntax - this is not it. I am a huge fan of the Excel Bibles. I’ve previously purchased older versions of the Excel Bibles: The 2013 and 2016 editions. The book is amazing and has absolutely transformed my career. I literally couldn't even do a sum formula, much less a vlookup. This book made it very easy for me to learn and advance using excel for my profession. Years later, I am now considered an 'excel expert' and I 100% attribute my success to the prior editions of the book. 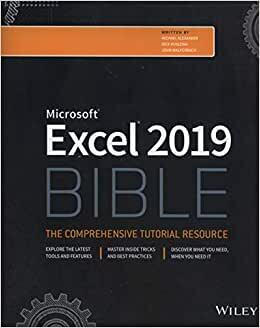 I picked up the most recent Excel 2019 Bible to see if it could improve on my more advanced excel skills. I have attached a photo of the table of contents to show the difference in each version. I believe it’s definitely worth purchasing this book to learn and understand excel. I absolutely love all the information that the book has to offer. At over 1,000 pages, the book is definitely long but very comprehensive. I have no doubt you can be great at excel if you are willing to put in the work of reading this book and doing the simulations. If you have already purchased the excel bible 2016 version, it will work fine if you are a beginner or intermediately skilled at excel. If you are advanced at excel and want to stay ahead of the curve, purchase this version. When you download the sample files, they are not arranged by chapter as stated in the book. They are arranged in alphabetical order without any respect to the chapters.